Becca and I went to the ocean yesterday. There’s always something to be said for a quick visit to the beach, but last night was a special treat, my first in a long time. She came out from the city to see me through my first radiation treatment, which was on Friday (I would recommend my niece Rebecca to anyone who needs a calm companion in an unfamiliar situation, only I’ve got first dibs). The air had cooled a bit, but it had that salty, misty haze that lingers after a hot day and sticks to glasses and camera lenses and skin. We stood there for a long time, letting our feet sink deeper and deeper into the sand with each wave, or sometimes walking up and down the beach. That dizzy, unbalanced moment — when you are planted safely while the whole ocean recedes around you — feels a lot like living life. Oh how glad I am you have a Becca in your life and that you got to see your beloved ocean at last. I am sending you more of those sweet peaceful waves for a smooth passage through radiation and a swift recovery. Becca sounds like wonderful companion. Gorgeous photo! What a wonderful way to spend an evening. Oh how wonderful it is to see Rebecca with you. I have been thinking about you so much since reading your blog about a month ago. My thoughts and prayers are with you. I would so enjoy knowing what Rebecca is doing now. Tell her the McLean County Museum of History sends their well wishes. A trip to the ocean seems like it would be so soothing. Becca sounds like the perfect, calming companion for your first radiation treatment. Beautifully written! 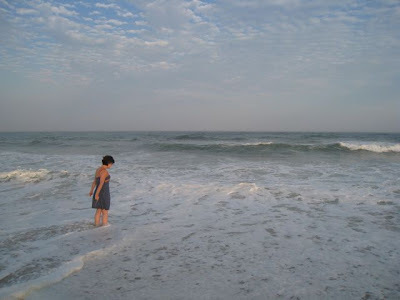 I know that feeling of dizziness as the ocean pulls back …Keep your feet firmly planted Jane! I’m glad you have good friends there with you right now. Beautiful ocean and great companion, does it get any better than that? Stay on the road to recovery. I agree.Beautiful picture, insightful and spiritual words. Jane:I’m glad you found some time this weekend to get to the beautiful ocean, especially after facing a tough day on Friday. Sending out thoughts of health and lovingkindness your way. The ocean is such a grounding force – I’m glad you have it, and Becca, nearby. The beach looks serene and peaceful. Sending healing thoughts your way. That photo is so soothing I keep coming back to look at it again. I am still sending you good wishes on your journey . Lovely, lovely photo. The colors are calming and soothing. The way the water meets the sky.The ocean is a wonderful healing place. Visit it as often as you can. Hugs to you. What a good way to recover from a treatment.